KiKi Layne and Stephan James play two young lovers at the beating heart of a ravishing film adaptation of James Baldwin's novel, "If Beale Street Could Talk." Rating: 4 stars out of 4. That’s what Jenkins, with able support from director of photography James Laxton, manages to do in this beautifully shot film: You see people like you never saw them before. The two young lovers at its heart, 19-year-old Tish (KiKi Layne) and 22-year-old Fonny (Stephan James), are filmed in ravishing close-up, as if the world slows down when they look at each other. We study them, centered in the camera’s eye, midgaze; their eyes thick with the emotion that first love brings, their expressions waiting to speak, taking pleasure in the silence. In short, we get lost in them, the way they’re lost in each other. Jenkins lets the story unfold slowly and patiently, giving his actors room to tell their own quiet stories. (Regina King as Tish’s mother Sharon, in particular, creates a fire of blazing maternal strength.) He fills the screen with beauty: a red umbrella on a wet gray day; cigarette smoking forming a sculpture around Fonny as he carves his own work; the warmth of Tish’s family’s home, with music perfuming the air. 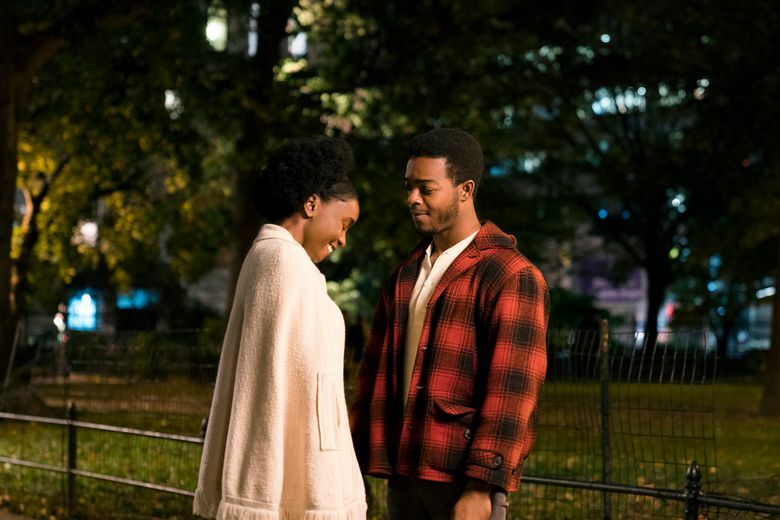 “If Beale Street Could Talk” is a film about injustice, about patience and anger, beauty and despair — but, ultimately, it’s about love. “Remember,” Sharon tells a despondent Tish, “love is what brought you here.” And it’s what you see in every frame of this movie, shining bright. ★★★★ “If Beale Street Could Talk,” with KiKi Layne, Stephan James, Regina King, Colman Domingo, Teyonah Parris, Michael Beach. Written and directed by Barry Jenkins, based on the novel by James Baldwin. 119 minutes. Rated R for language and some sexual content. Opens Dec. 25 at SIFF Uptown, Regal Meridian.